All text and images on this site are (C) T.Davis 2005-2018. Unauthorised publication, duplication or use is prohibited. Site optimized for viewing at 1024 x 768 pixels. 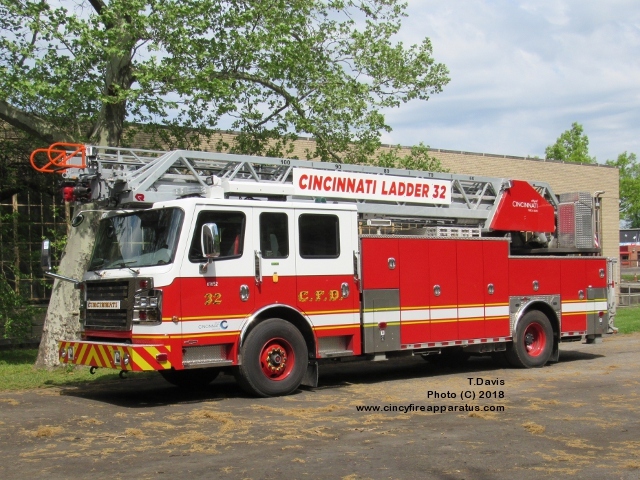 Featured Photo - Cincinnati Ladder 32 is a 2017 Rosenbauer Commander. 07/08/18 - General update of Cincinnati Station 31, added the updated Station 31 logo along with some additional apparatus photography and video links. 07/01/18 - Split coverage of the Cincinnati Fire Department's Mass Casualty Units and Decontamination Units into 2 new pages and added photos of all of the units. The page for the Decon Units is here, and the page for the MCU's is here. 06/24/18 - The 1995 E-One previously assigned to Engine 18 has been reassigned to the Training Bureau as Engine 229. This move took place last October but realized the Training Bureau page had not been updated so added photos of Engine 229. 06/16/18 - Cincinnati received four new Ford / Horton ambulances in May. They have been placed into service with Medics 17, 23, 29 and 51. Photos of the new ambulances have been added to their respective station pages, and the medic roster page has also been updated. 03/11/18 - Cincinnati Medic 2 has received a new Emergency Vehicles Plus remount ambulance, and the Station 2 page has been updated with the new arrival. 03/05/18 - Updated the Cincinnati Station 35 page with the new Emergency Vehicles Plus remount ambulance for Medic 35. 02/03/18 - A new Ford / Horton ambulance has been placed into service with Medic 24. The Station 24 page has been updated with the new arrival along with the station logo, which was revised in late 2017. 01/12/18 - Elmwood Place purchased a 1991 Sutphen from Evendale that previously ran as Engiine 240. The Sutphen has been placed into service with Engine 39 and the previous Engine 39 has been retired. The Elmwood Place department page has been updated with the changes. 11/19/17 - The 2011 Spartan / Rosenbauer previously assigned to Ladder 20 has been reassigned to Ladder 35. 11/12/17 - Cincinnati Ladder 2 also received a new Rosenbauer aerial. The Station 2 page has been updated with the new arrival, and also added some additional station and apparatus photograpy. 11/04/17 - The 2009 Rosenbauer previously assigned to Engine 24 has been reassigned to Engine 18. The Station 18 page has been updated with new arrival along with a large update of apparatus / station photography. 10/22/17 - Updated Cincinnati Station 20 with the new Rosenbauer aerial for Truck 20. Also added some updated station and apparatus photograpy. 09/04/17 - Cincinnati Engine 24 placed into service the third new pumper truck received from Rosenbauer this year. The Station 24 page has been updated with the new arrival along with updated station and apparatus photography. 08/26/17 - Cincinnati District 2 placed into service a new Ford Police Interceptor. The Station 17 page has been updated with the new vehicle. 08/18/17 - Updated Cincinnati Station 19 with the arrival of the new Rosenbauer pumper truck for Engine 19. 08/02/17 - Updated Cincinnati Station 32 with new photos of Foam 32 and Trench Trailer 32 along with updated station photography. 07/22/17 - The new Rosenbauer pumper truck for Cincinnati Engine 23 has been placed into service. The Station 23 has been updated with the new arrival. 07/07/17 - The Cincinnati Station 14 page has been updated with the arrival of the new Heavy Rescue 14. 05/07/17 - Medic 9 received a new Emergency Vehicles Plus ambulance. It is a remount of a Braun boxe on a new Ford F-450 chassis. The Station 9 page has been updated with the new arrival along with updated photography of Engine 9 and their company logo. 04/28/17 - Added a new department page covering the Miami Township Fire Department in Hamilton County. The new page can be accessed through the Index / Site Map page. Will be adding coverage of some additional departments over the next few months. 03/17/17 - Cincinnati District 4 received a 2017 Ford, and It is the first Police Interceptor model placed into front line service with the CFD. The Station 31 page has been updated with the new arrival. 02/04/17 - Cincinnati Medic 3 and Medic 12 each received a new Emergency Vehicles Plus ambulance. They are both remounts of Braun boxes on a new Ford F-450 chassis. Images of the new ambulances have been added to their respective station pages, and the medic roster page has been updated as well. 12/27/16 - The Cincinnati Fire Department has added a new fire response level - the Still Alarm which is between an alarrm drop and a 1 alarm response. A new page detailing dispatching with apparatus by incident type has been added to the Cincinnati reference section. The page covering Cincinnati unit designations has also been updated and expanded. 12/08/16 - With the move of Cincinnati Truck 21 to Station 35, the Mobile Command Center has been moved back to Station 12.. The Station 12 and Station 35 pages have been updated with the location change. 11/25/16 - Updated Cincinnati Station 37 with some new apparatus / station photography, and added a link to a video of Engine 37 responding from quarters. 11/09/16 - Cincinnati Medic 19 has placed a new Ford / Horton ambulance into service. The Station 19 page has been updated with the new arrival along with some updated apparatus / station photography. - The first F-series chassis was purchased in 2013, and now all front-line units are running F-series chassis. - With the large number of purchases over the last couple of years the oldest front-line ambulances are 2013 models assigned to Medics 9 and 12. 10/19/16 - Cincinnati Medic 17 received a new Emergency Vehicles Plus ambulance, and it is a remount of a Braun box on a Ford chassis. The Station 17 page has been updated with the new arrival. There are currently 688 apparatus, 81 fire stations and 6 boats pictured on this web site. Cincinnati - Received 6 new Ford / Horton ambulances, they have been assigned to Medics 17, 23, 24, 29, 46, 51. Two new Ford / Braun / EV+ remount ambulances have also been received for Medics 2 and 35. The new fireboat for Boat 3 has arrived, and a new Rosenbauer for Heavy Rescue 9 is due by July. Also on order from Rosenbauer are 2 pumper trucks and 1 ladder truck. The department has also ordered 2 E-One ladder trucks with delivery anticpated before the end of the year. If you have an event you would like to list, a new delivery to report, or any corrections to the data on this site just send me an email. Box 13 Associates Proudly serving the Cincinnati Fire Dept since 1933 - link.